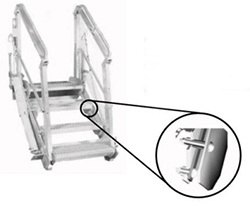 Aluminum Ladder Company makes gangways used for loading and unloading cargo from tankers, trucks and barges. This means handling heavy loads in dusty conditions. The bearings in their existing gangplanks failed regularly due to wear, and the huge expense and downtime to replace 20 of them at a time was unacceptable. When it came time to design their new gangways, Aluminum Ladder came to Spyraflo looking for a better solution that would handle articulating, self-leveling treads. How does a lower-cost, better-performing, no-maintenance solution sound? While the customer initially identified an expensive, bulky bearing made by another manufacturer, our solution was clearly superior. A slight modification to our standard self-clinching, self-aligning 0.750”-diameter PTFE-composite bronze and 0.625”-diameter acetal AF self-clinching, self-aligning bearings was the answer to Aluminum Ladder’s gangway problems. These bearings easily handled the component misalignment issues that caused so much wear. They also completely eliminated the maintenance expense and downtime.